Resource Center Hallucinogens: What Are They and What Are Their Effects? Hallucinogens: What Are They and What Are Their Effects? Hallucinogens are drugs that affect several areas of the brain, producing visual, auditory, or tactile hallucinations. Sometimes, hallucinations may include smells or tastes, but reports of these are rarer. Essentially, hallucinogens alter perception of one’s surroundings, objects, the passage of time, or other conditions. Along with these changes come changes in thoughts and feelings, which may lead to spiritual or religious experiences. In some instances, these changes could have a negative impact on the person. How Dangerous Is a DMT Trip? What Is the Drug Flakka? Drugs with hallucinogenic properties can be natural or artificial; they can be produced by a plant, or they may be manufactured in a laboratory. Most hallucinogenic drugs are not considered addictive, but some drugs that cause hallucinations along with other effects, like euphoria, may become addictive. Older hallucinogens are not linked to overdoses, although they may be linked to hospitalization due to psychotic symptoms; new hallucinogens, often manufactured in clandestine drug labs, put the user at a higher risk of overdose. The National Survey on Drug Use and Health (NSDUH) for 2014 found that first-time use of hallucinogens has remained steady since about 2002, with few people abusing these drugs regularly or in compulsive patterns suggesting addiction. About 1.2 million people, which is about 0.4 percent of the US population ages 12 and older, reported abusing hallucinogens in the past month. More men than women tend to abuse hallucinogenic drugs. While these numbers are low compared to other substances of abuse, like opioids, alcohol, and marijuana, hallucinogens put a person at risk of acute and chronic health problems. Many people who abuse hallucinogens also abuse other intoxicants in a dangerous pattern of polydrug abuse. There are a few classes of hallucinogens. Psychedelics: Also called classical hallucinogens, most psychedelics are naturally occurring, like psilocybin; however, LSD is the standard in this group, which is manufactured in a handful of clandestine drug labs in the US. Currently, most researchers believe that psychedelics attach to several receptors in the brain, causing the release of a large amount of dopamine, serotonin, and other neurotransmitters, prompting several areas of the brain to become active at once. Dissociative drugs: The main effect of dissociative drugs involves dissociating from reality, leading to the experience that the world around a person is not real, or that they are in a dream-like state. Many of the drugs in this class, such as ketamine, also produce amnesia and pain relief, and they may become addictive. Deliriants: These drugs cause intense confusion and difficulty controlling one’s actions. Datura is the drug most often associated with this group, causing symptoms similar to a fever-induced delirium. Research chemicals and designer drugs: Designed in laboratory settings, many research chemicals began as synthetic analogs of natural substances, allowing scientists and medical researchers to study the effects of these substances on specific parts of the brain. Unfortunately, clandestine labs are now reproducing publicly available research chemicals and selling them, untested, without understanding the dangerous effects associated with them. The most famous among these drugs are the NBOMe substances. There are several varieties of hallucinogens that are abused. Some of the most famous are outlined below. Ayahuasca: Typically consumed as a tea, this plant is cultivated in the Amazonian rainforest. Tribes native to the region have used this substance for religious rituals for thousands of years, but now ayahuasca use is focused on tourism from around the world. US residents cannot legally bring the drug into the country, but many people go on vacations specifically to take this drug. This is the most infamous of several kinds of plants that contain the mind-altering chemical dimethyltryptamine (DMT). Dimethyltryptamine (DMT): This chemical is also extracted in clandestine laboratories and sold by itself. It can be found as a whitish crystalline powder. DMT is famous for short-lived hallucinations involving geometric shapes, which are very similar for everyone who consumes it. This effect is rare, as other hallucinogens cause a variety of mental, emotional, and physical experiences. D-lysergic acid diethylamide (LSD): One of the most famous of the mind-altering psychedelic chemicals, this drug was originally legal in the United States and often given to psychology students so they could understand the mental state of those with schizophrenia. Students in the 1950s and 1960s began to divert LSD to abuse for recreational purposes, which became so culturally problematic that LSD was one of the first drugs to be placed in Schedule I – with no medical purpose – according to the Controlled Substances Act (CSA). LSD is derived from ergot, a grain fungus. Peyote or mescaline: A small cactus that naturally produces the chemical mescaline, peyote has been used in religious rituals in Central and South America for millennia, and it is one of the oldest known hallucinogenic drugs. Because of its popularity, mescaline is sometimes processed out of peyote and sold as a white powder or tablet. The intense hallucinations associated with peyote or mescaline may trigger mental illness in those predisposed to this condition. Psilocybin, psilocyn, or shrooms: The closely related chemicals psilocybin and psilocyn can be found in at least 75 known species of mushrooms that are native to many parts of the world, including North America, Europe, South America, and Southeast Asia. Dried and either eaten or brewed into tea, magic mushrooms or shrooms contain natural amounts of either or both of these chemicals, which can be difficult to measure. The mushrooms themselves are not regulated by the CSA, but the chemicals they contain are. Shrooms typically produce body highs, auditory hallucinations, and changes to the perception of time, but they can produce visual hallucinations, too. Salvia divinorum: A plant related to sage and mint, this potent hallucinogen has, like other plant-based hallucinogens, been used for religious rituals in Central America for thousands of years. Because there are many varieties of salvia that are used in food or for ornamental reasons, salvia divinorum is not regulated in the US; however, the drug can be dangerous, causing intense highs. The effects set in around 15 minutes after it is smoked, chewed, or inhaled; it is less potent, and not hallucinogenic, when it is consumed orally. Dextromethorphan (DXM): In very small doses, this drug is found in over-the-counter cough syrups and capsules that treat symptoms of the cold or flu. In larger doses, though, this synthetic drug goes from being a cough suppressant to a dissociative anesthetic; a person who abuses DXM will experience changes in time, distorted visual perception, some stimulation, and dissociation from one’s body. Ketamine: Once used as a surgical anesthetic, this drug is often cited for its notorious dissociative effects. It is still used sometimes in the medical field, but it is only applied to humans when other anesthesia does not work. People who receive ketamine as a surgical anesthetic are known to wake up disturbed, disoriented, and afraid. Dose-dependent effects include a sense of floating and body dissociation, stimulation, and hallucinations. Large doses produce an effect called the K-hole, when a person feels on the edge of death or has an out-of-body experience because they are very close to being fully anesthetized. Phencyclidine (PCP): Also originally developed as a general anesthetic, this drug produces dissociative effects, and it is still sometimes used in the medical field. As a white crystalline powder, the substance can be dissolved into a drink, like water or alcohol, and consumed; it may also be sold in tablets or capsules. Low doses produce hallucinations, typically either visual, auditory, or both; and large doses can produce an overdose, coma, or death. NBOMes: These dangerous drugs are technically legal in many states, and they are often marketed as legal LSD. However, this class of synthetic hallucinogens produces rapid, intense, and long-lasting hallucinations that often cause psychotic effects, causing the person to accidentally harm themselves or others around them. There are reported cases of overdose associated with NBOMes, including at least one death. Call now, be in treatment within 24 hours. There are several short-term effects caused by hallucinogens and a few long-term effects that may become chronic conditions. Some hallucinogens may trigger heart conditions or stomach problems in those who are prone to these issues. Underlying heart issues combined with any potent drug, including hallucinogens, can cause a heart attack. In rare cases, in which a person takes a large dose of a hallucinogen, the individual may trigger persistent psychosis. This is more likely in a person who is at risk for a mental illness, but it can also occur in those with no known risk factors. 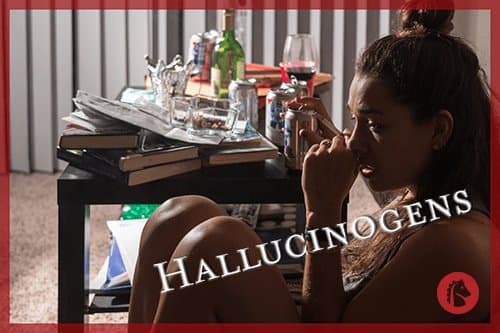 Dissociative hallucinogens are more dangerous because they are more likely to induce panic, dissociation from reality, increased blood pressure, heightened temperature, breathing rate, and numbness. High doses of some dissociative drugs, like PCP, may cause seizures; some people become extremely violent and are likely to cause harm to those around them; and some people may spontaneously stop breathing, experience dangerously high body temperature causing damage to internal organs, or suffer from a heart attack. While psychedelic hallucinogens do not cause many harmful long-term effects, dissociative hallucinogens, deliriants, and research chemicals may cause brain damage. Memory, cognition, speech, mood, and social life can all be negatively impacted by these drugs. It is very rare for hallucinogens to cause overdoses or withdrawal symptoms, but there are some negative impacts associated with consuming hallucinogenic substances. The riskiest part of hallucinogenic drugs involves a changed perception of reality, which is the goal of taking these substances. However, people may have a “bad trip,” and experience panic, anxiety, and paranoia. They may see terrible things that are not real. This can lead to accidental harm to oneself or others, including falling, lashing out at hallucinations, damaging the skin due to tactile hallucinations, displaying erratic behavior, and even committing suicide. Some hallucinogens produce “flashbacks,” or hallucinogen persisting perception disorder (HPPD). LSD is the most famous substance that causes this condition, but a few other hallucinogens may induce this effect. HPPD can involve seeing light trails or halos around light sources, re-experiencing emotional sensations from the trip, or having other visual, auditory, tactile, or emotional experiences associated with the original trip. LSD can produce HPPD in people even after one use. While flashbacks are not often considered negative, they can be distracting in dangerous situations, and they can cause panic or depression. People who have schizophrenia or other related psychotic disorders should not take hallucinogenic drugs because it will make symptoms worse and harder to treat. While marijuana is the most commonly abused psychedelic drug among those with schizophrenia, other hallucinogens can increase tardive dyskinesia, manic episodes, and perceptual problems with reality versus fantasy. Abusing these drugs earlier in life can also bring the condition on earlier.